This quality reproduction of the Coleman #322 Shade features hand-painted flowers in pinks and garland/foliage in greens on the inside of the shade. The combination of frosted and clear glass allows for the maximum light output, while providing a soft warm glow. 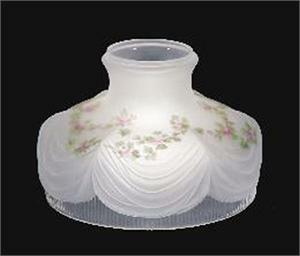 This Coleman Style shade is made of hand-blown glass. 10" base diameter fitter makes this shade a great pick for a Coleman Pressurized Table Lamp, Aladdin Lamp, Rayo Lamp, or other non-electric table lamp with a 10" shade ring/shade support. This #322 Garland Shade has a 10" base diameter and is 7" tall.